dream of kinetic and oral poetry. A sumptuous feast for all your senses, mind and heart. Touring party of two, can be performed at any theatre or gallery setting. First performed at Auckland Fringe 2013. What happens when you cannot sleep? What happens when you cannot daydream. Is it a gift, or a curse?Insomnia takes you for a dive into the subconscious mind – personal, interpersonal and universal. 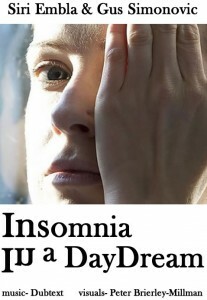 What happens when Insomnia spreads its fingers into our day-life? When, not only eating our dreams away, it impacts on our imagination and enters our last refuge – our daydreams. The reality, as we know it, is reduced to an iridescent bubble made of our illusions, fears and half-wishes. In an attempt to protect ourselves from this condition we are sent into a different state.